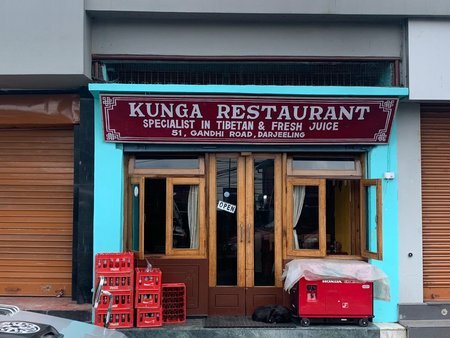 Kunga is a tiny budget restaurant located on Gandhi Road and in the same building as Dekeling Hotel. This family run restaurant is over 2 decades old and specializes in Tibetan dishes and serves great Chinese food as well. As you enter through the wood framed glass door, inside the restaurant walls all wood paneled. At the end there is a small cash counter. Right behind the counter is the kitchen which you can see through a large glass pane. There are only four small tables on the left and three on the right. So the restaurant can seat about 20 persons, and unless you come early you will likely find it packed. The guests take their own time to eat in the relaxed casual atmosphere inside. So if it's full, the wait can be long. Kunga is a favorite for the foreigners. That's because the food served is not only good, the portions are large and the price is comparatively cheap. And on top of it, the ambience is casual and friendly. But the flip side is, sometimes it can get quite noisy inside as people keep chatting and you may even have to share tables with others. The tables have red colored cloths and topped with glass sheets. The cushioned wooden chairs are quite comfortable. However the space between the tables are quite limited and so is the leg room. But who cares? It's after all a great cozy place. You come here for steaming hot good quality food at a cheap price and not to have a formal dinner. So what kind of food do you get at the Kunga? As you take your table, the menu card is placed right under the glass sheet of the table and always available to you. The menu is not very long but enough to choose a goad meal from Tibetan or Chinese dishes. In Chinese you will get different kinds of Chinese soups. For main courses starting from steaming hot plain rice you get different choices of fried rice and chowmein both with vegetarian and non-vegetarian preparations. The chili chicken and manchurian chicken are excellent. Then there are spring rolls and other side dishes as well. Kunga however boasts of the Tibetan dishes they specialize on. The steamed momos (dumplings with chicken, meat or veg fillings) are really special. You get 10 pieces in a plate. When I asked the owner lady about what would be the best dish to try in the restaurant, she recommended Chicken Thenthuk Soup, a delicious Tibetan noodle soup that you must not miss, and its quite cheap compared to its quantity. This is one of the best dishes here and is more than just an appetizer. If you don't take non-veg, there are Tibetan vegetarian soups as well. Another favorite of mine here is the Chicken Wanton Soup which is similar to chicken momo soup that also has shredded carrots and other vegetables and herbs. It's out of the world and almost like a meal by itself. Actually once I saw an European having the soup while I ordered for Chowmein and Chili Chicken. I decided that the next day I would come and certainly try out the Wanton Soup. It just looked too good to resist. 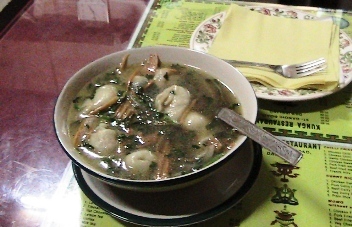 There are some eight pieces of steamed momos that come dipped in the soup. If you accompany this with Tibetan bread with butter, you really don't need anything else. 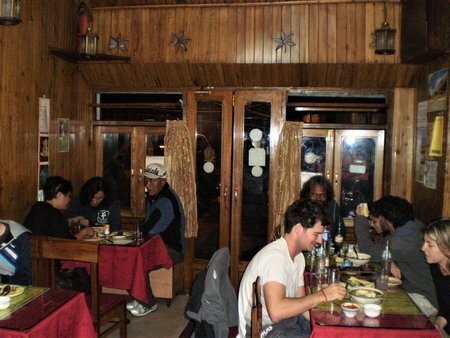 The foods prepared in Kunga are mostly without much spices and that's another reason why the restaurant is so dear to the foreigners. Some of the other great items include Beef Bhakthuk which is another type of noodle soup prepared with beef, then there is chicken phing, fried beef wai wai etc. Finally for beverages, either you can go for the Tibetan Tea (you may not like it if you are not familiar with it. It's not like the usual tea) or some fresh fruit juice. There is another great beverage which is my personal favorite. It's the Lemon Tea with Ginger and Honey. It's served on a glass with a piece of ginger in it and a tea bag. As you dip the tea bag, it forms a wonderful golden tinge. The tea tastes superb. Lemon tea with ginger & honey is an ideal hot beverage to warm you up in a cold evening. The lady in the restaurant told me that the combination of ginger and honey gives a medicinal effect as well and helps to fight cough and cold. But I take it just for the unique taste and its wonderful look. There are five staff in this small but busy restaurant. The service is very good and the food comes quite fast. They also give you a paper and a pencil (mainly meant for foreigners) to write down your items. This is to avoid any ordering confusion. As I said that the portions or the quantities are really good and it would be difficult to finish off the food unless you order prudently. For example a plate of fried rice and a plate of chili chicken should be good for two. If there is any left over, they pack it for you if you so want. The restaurant serves breakfast, lunch and dinner. They don't take cards and accept only cash. They are open all seven days a week including the low season. They always seem to find good number of clients to keep running the restaurant through out the year and without a break which is quite unusual for a restaurant of its category and size. That speaks volumes of its good will. Kunga is right on Gandhi road below the Dekeling Hotel and is centrally located. It is right next to the taxi stand & the car park on Gandhi Road and in a busy location. On it's left and in the same building there is another restaurant Dekevas which too gives a nice option for Chinese, Tibetan and also Continental food including Pizzas.